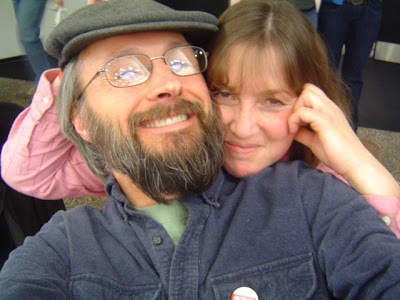 This is yours truly, and My Darling B, at the first annual Beer and Cheese Festival sponsored by the Isthmus. I managed somehow to snap this photo of us one-handed after drinking beer for three hours. You might infer from this that we were sober and steady-handed. Appearances can be deceiving. The Isthmus is a local advertising newspaper (and web site) that is all-knowing, as far as local social events are concerned. We refer to it often to find out what’s going on where, and at what time. Beer and cheese are Wisconsin staples, so it’s only natural that we would have an annual festival devoted to their adulation. I’m only surprised that this is the first annual such festival. A wonderful idea. I hope they can pull it off again next year. You might think that I, a lactose-intolerant person, might be a bit rash going to an all-day festival to imbibe beer and nosh on cheese, but I had a bottle of pills in my pocket that have done wonders for me. I popped one pill about a half-hour before we left and another pill every hour on the hour after that. I’m happy to report I passed the afternoon accident-free, although I have been a little aromatic throughout the evening. They’re great little pills, but they’re not magical. We are blessed here in Wisconsin with an abundance of cheese makers and beer brewers, so the festival was a success. Had to be a success, really. It’s just impossible to put that many foods and drinks together that taste so good and not have it turn out to be amazing. They even cheated a little bit and invited Gail Ambrosius to bring some of her chocolates to pair up with some of the beers on hand. All in all a wonderful day that My Darling B and I enjoyed immensely, as you can see from the photo. I’m sure we’ll go back again next year.